Keep the love burning by bringing back the childlike charm of a budding romance, the freshness of love that\'s newly blooming. Win her heart all over again with this gift package priced within budget at only $68. 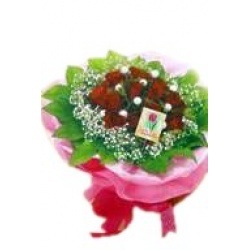 It is a pretty bouquet of only the freshest 1 dozen white roses of premium quality, wrapped elegantly. This gift package is ideal for Valentine's Day, Anniversaries, occasions for Roses, and occasions for Floral Bouquets. Red roses epitomize love and also symbolize courage and respect. 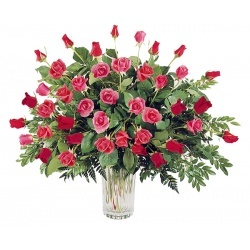 Keep that special someone closest to your heart with this beautiful red rose bouquet priced within budget at only $68.00. This gift package consists of 1 dozen red roses of only the freshest, excellent quality, wrapped elegantly to let the whole world know just to whom your heart goes out. Nothing is more irresistible than red roses, until you came along and sneaked the most indulgent chocolates in the bag. Send your love with the sweetest gift package at a budget-friendly price of only $85. It includes only the freshest 1 dozen red roses of excellent quality, wrapped elegantly with 1 box of premium Italian chocolates, Ferrero Rocher. This gift package is ideal for occasions for Roses, Anniversaries, and Valentine's Day. Red and white roses symbolize the perfect union. They are perfect for romance, a wedding or an anniversary, friendship, a get-together or homecoming, and business, a merging or long awaited reunion. At a budget-friendly price of only $118, this gift package consists of only the freshest, excellent-quality 2 dozen red and white roses, arranged in an elegant vase. This gift package is ideal for occasions for Christmas, and Valentine's Day. 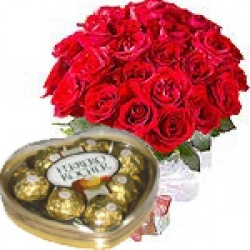 This gift package is ideal for Valentine's Day and occasions for roses. For that special someone who can completely light up every room she enters, nothing is more fitting than a beautiful shower of red roses and white pearls. Priced affordably at only $75.00, this gift package consist of only the freshest, premium-quality 1 dozen red roses wrapped elegantly, enhanced with a sophisticated accent of white pearls. Whether the occasion is simple and lovely or grand and sophisticated, you can not go wrong with pink roses. For an affordable price of only $68, this gift package is a beautiful bouquet of only the freshest, superior-quality 1 dozen pink roses wrapped elegantly. Pink roses do not only symbolize love but also stand for admiration and gratitude. 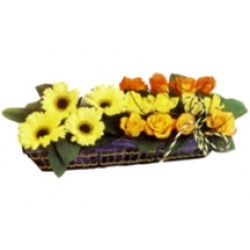 This gift package is ideal for occasions for Roses and Get-Well-Soon occasions. For occasions that call for something extra special, send your flowers wrapped in something extra protective. Priced within budget at only $95, this gift package consists of 2 dozen roses of the freshest, choicest quality, wrapped elegantly and encased in a shipping box to get to its destination safely. Roses symbolize love, happiness, gratitude, and purity of heart. 3 TOBLERONE CHOC 100G comes for FREE for every order of this spectacular rose arrangement. Priced within budget at only $178, this gift package consists of 4 dozen roses of only the freshest, excellent quality, arranged elegantly in a vase. A universal symbol of love, roses also signify happiness, gratitude, and purity of heart. This gift package is ideal for occasions for Valentine's Day, Roses, Anniversaries, and Mother's Day. Red roses are a universal symbol of love as well as courage and respect. White roses stand for innocence, charm, and purity of heart. Sounds like someone you know? Send your love with this gift package at an affordable price of only $68. 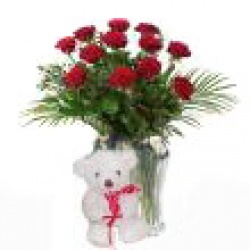 It includes 1 dozen red and white roses of only the freshest, superior quality, arranged elegantly in a vase. This gift package is ideal for occasions for Roses and Christmas. Her rosy cheeks, her radiant glow, her blushing, you love her because she's pretty in pink. Treat her to a shower of pink roses with this gift package priced within budget at only $68. It consists of 1 dozen pink roses of only the freshest, superior quality, arranged elegantly in a classy vase. Pink roses stand for love and also admiration and gratitude. White roses symbolize innocence, charm, and purity of heart. They are perfect for weddings, solemn occasions, kids and young celebrants. At a budget-friendly price of only $68, this gift package consists of 1 dozen white roses of only the freshest, choicest quality, arranged elegantly in a classy vase. White paired with red roses symbolize the perfect union.